Passengers are being advised to plan their journey to and from London Paddington as early as possible this Christmas ahead of Network Rail’s biggest ever Christmas upgrade. The programme of upgrade work will cause disruption to services across Great Western main line and west London with up to 200 projects being delivered across the UK over this holiday period. This essential programme of investment is part of Network Rail’s Railway Upgrade Plan that provides more and faster services to help relieve over-crowding and responds to the tremendous growth encountered on Britain’s railways. There will be disruption to services out of London Paddington from the early hours on Christmas Eve through to Tuesday 3 January which means that passengers travelling to and from London need to interchange at Ealing Broadway station up until Thursday 29 December. 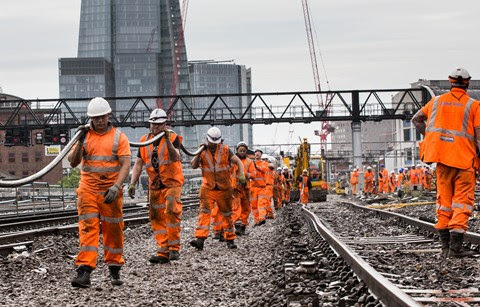 Phil Hufton, managing director England & Wales at Network Rail, said: “Work takes place all year round as part of our railway upgrade plan, but we usually carry out larger upgrades over bank holidays as this is when passenger numbers are at their lowest. This Christmas will see significant investment in our railway with thousands of Network Rail’s orange army working hard to deliver hundreds of crucial projects to improve Britain’s railways. This will mean changes to services over the festive period, so we strongly advise passengers to plan their journeys as early as possible. Larger pieces of work are planned for bank holidays as they are generally quieter periods with fewer – up to 50% fewer – passengers travelling by rail. Work on a few major projects will begin on Christmas Eve, a Saturday this year and a quieter time for rail travel, giving engineers and maintenance teams four clear days to make significant progress on major projects that will deliver numerous passenger benefits. Passengers are being advised to plan their journeys more carefully this year as there will be significant changes to train services out of London Paddington and London Liverpool Street. A breakdown of how journeys may be affected can be found by visiting nationalrail.co.uk/Christmas and following #ChristmasWorks on Twitter.